I have gotten the strangest comments on this blog since I turned off the ridiculous "Prove you're not a robot" step for leaving a comment. I have pondered with the idea of leaving similar comments on blogs I read frequently. "Hey... beautiful post. Glad I stopped by today. I have been thinking so deeply about many of the things you mentioned. It's like you read my mind. This looks like a refreshing place to dip into some serious goodness. Check out my website..."
That was an actual comment I received after turning off the robot guard. We have started our summer, but you wouldn't know it from the weather which has been completely lousy. But you can tell it's still early summer because Allison and I are all motivated and energized to do things like an art class for the kids on sculpting. I am writing the lesson plans for LMCA and I realized how excited I am about this new adventure. We could really use some help advertising, so if you are local and would like to help hang flyers at your church and stuff, please let me know! It was made from a fat quarter bunch that the store had leftover from a class. I am trying to get as much sewing in as I can this summer since LMCA meets on Wednesdays and I know my sewing time will be limited come Fall. Join the fun! 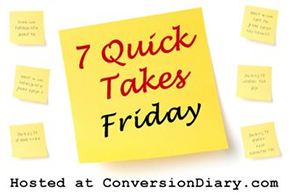 Head over to Conversion Diary to read more Quick Takes or link up your own!